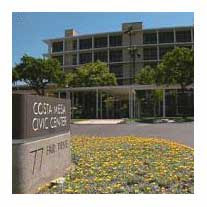 It's going to be an interesting week in Costa Mesa politics. Tonight, in what may be the shortest Planning Commission meeting in history, the Planning Commission will first seat the two new members, Colin McCarthy and Stephen Mensinger - the two candidates who apparently were the high bidders for these seats. Personally, I cringe when I contemplate what this commission is going to be like with them on it. We don't need any more development flacks on the commission, but that's what we've got - and now they'll have the majority. They will then recognize the contributions of outgoing commissioners Eleanor Egan and Donn Hall. Both deserve this recognition for their many years of stellar service to our city. Then they will elect a new Chairman and Vice Chairman. The only other item will be a rubber-stamp approval on an issue involving Sakioka Farms property developement. I could see this meeting lasting only 10-15 minutes, tops. I'm going to take a page out of the CM Press song book and post an addendum to this message instead of posting a new one. This is a little summary of the brief (40 minute) Planning Commission meeting. The Planning Commission meeting tonight was full of revelations. First, Vice Chair Jim Fisler handled the commendations for Hall and Egan with dignity. Good job, Commissioner Jim. Second, because new guy Steve Mensinger was "on vacation out of the country" he was a no-show. This created a very interesting situation. Because there were only four commissioners present, it was not possible for them to agree on a candidate for Chairman! Sam Clark nominated Fisler and rookie Colin McCarthy nominated Jim Righeimer. Both votes were 2 to 2. Then Fisler nominated Clark - same result. So, the election of both officers - the Chairman and Vice Chair - was re-agendized to their next meeting. This sounds ominous for Fisler and Clark, since we assume Mensinger will vote with Riggy and McCarthy. All of a sudden the two "improvers" on the dais are about to be marginalized. Then, The Mouth From Mesa North - who apparently was snoozing in his seat in the back of the room - didn't hear Fisler call for public comments. He asked for it to be re-opened, which the commissioners agreed to do. Then, instead of holding him to the normal 3 minutes, they permitted him to rant for nearly 5 minutes, during which he gave them their marching orders. This also does not bode well for the residents of this city - particularly those with brown skins. Tomorrow, in their study session, the City Council has some interesting things to discuss. As mentioned in an earlier entry, the will discuss the mid-year budget review. Before that they will discuss the issue of a financial assistance program to those who must repair their sewer laterals. For those who don't know it, property owners are responsible for the sewer pipes that extend from the sewer main to the residence, even though much of it may be under the city streets and sidewalks and may be obstructed by city trees and other plantings. The Sanitary District and the City are working on an arrangement whereby they will provide financial assistance to property owners who find it necessary to have work done on their laterals. ADIOS TO OUR EQUINE FRIENDS? Also on the agenda for the study session is the white-hot issue of the Equestrian Center at the Orange County Fair and Event Center. The Fair Board wants to pave over the Equestrian Center for more parking during the Fair, which will now run 5 weeks! I'm trying to figure out why we need a 5-week Fair in the first place. I mean, how many deep fried Twinkies can you eat, for goodness sake? Each of these items will certainly appear on the City Council agenda in the very near future. If you have an interest in any or all of them you may want to attend the meeting - which will be held in City Hall in Conference Room 1A beginning at 4:30 Tuesday. It will also be televised on tape delay on Costa Mesa TV, Channel 24 on your Time Warner Cable. Why not a 5 week fair? If you think the fair is just about fried twinkies than you haven't been lately!